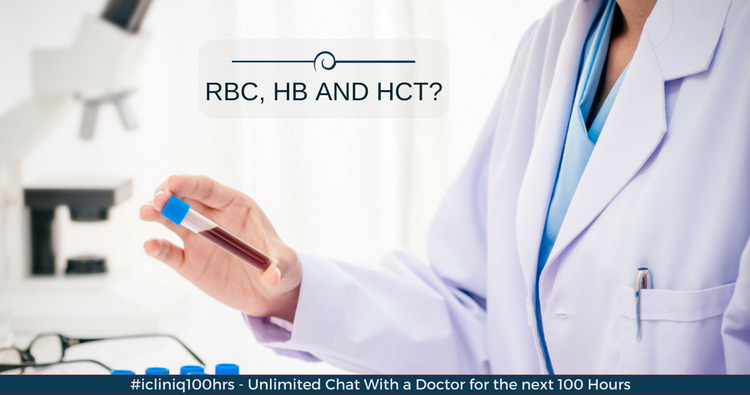 iCliniq › Ask a doctor online › Answers › Hematology › High Rbc Count › What can be the reason for elevated RBC, Hb and Hct? Q. What can be the reason for elevated RBC, Hb and Hct? I am a 34 year old female. I have been itching all over for months and constantly covered with bruises, petechiae and livedo reticularis. I was diagnosed with erythromyalgia. I also have severe bone pain. My blood work came back with elevated RBC, Hb, Hct, low alkaline phosphate, low BUN and creatinine. My vitamin B12 levels are in 1000s and not under 200. The neurologist says that I have fibromyalgia and changed my seizure medicines for juvenile myoclonic epilepsy. Do I think that I should visit a hematologist and figure out why my bones hurt so badly in my legs and why I am so itchy? My current medication includes Oxycodone and Lamotrigine for epilepsy. • What is your suggestion for polycythemia? The elevated hemoglobin, red blood cell count and hematocrit signify polycythemia. Elevated Vitamin B12 level is one of the markers of myeloproliferative disorder. I would strongly think of polycythemia vera. Other values are within normal range (attachment removed to protect patient identity) suggest no renal or liver disorders. Increased hematocrit will slow down blood flow due to increased viscosity and this can cause few RBC to move out and lead to these symptoms. Even migraine, bone pain and increased itching can be attributed to sluggish blood flow. Polycythemia vera is a cancerous condition and requires evaluation. I would strongly urge you to meet hematologist. Hope there are no other causes of polycythemia like lung disorders or staying in hilly regions, etc. With high vitamin B12 and polycythemia, polycythemia vera needs to be seriously evaluated.